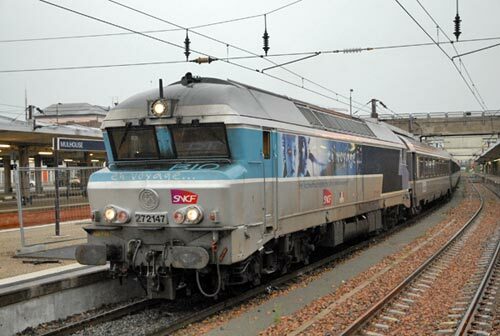 The former main line from south-east France to the capital has recently seen a significant reduction in services due to the new opening of the new high speed line from Dijon to Belfort. Despite the reduction in services there are still a number of inter-city trains operating on this route with haulage in the hands of the impressive Class 72100 C-C diesels, which were rebuilt from 72000 diesels originally introduced to service in 1967. Rated at 3650 hp these large diesels have recently been criticised for environmental reasons and must be near the top of the list for replacement. Photo - SNCF 72147 is ready for departure from Mulhouse with the 07.42 inter-city to Paris Est. Joining the 07.42 inter-city on a wet Sunday morning in July 2011, 72147 was at the head of the train noisily throbbing as it waited departure. The train was surprisingly well-filled despite faster TGV services to Paris being on offer. There is very little difference on which side of the train you sit so just follow your instincts. Overall you perhaps see more of railway interest if sitting on the left hand side when looking towards the front of the train. The route to be taken included stops at Belfort, Lure, Vesoul, bypassing Chalindrey non-stop, to continue via Chaumont and Troyes to Paris. Departure was on-time and from the front coach the roar from 72147 was clearly audible as we headed out of Mulhouse through green countryside towards Belfort. Here, like many stations in France, the demise of freight traffic was all too evident with large yards devoid of action instead being full of rusting out of use wagons. Departure from Belfort takes you past one of the Alsthom factories and you can see a multi-gauge test track running parallel with the line on the left-hand side. The section from here still has telegraph wires along the line, a feature which takes me back a few years. At each station more passengers piled on board with the train soon full to capacity. There was little change in the countryside to Chalindrey where the depot that services the 72100's is on the left before reaching the junction. The route is double track yet no trains were passed all the way from Belfort to the outskirts of Paris. It begs the question as to why this route has not been reduced to single track in some sections. Heading north through Chaumont, where there is an impressive viaduct, the landscape changes with wheat fields becoming dominant. At least there remains some evidence that grain is still shipped by rail with storage silos and sidings full of grain wagons ready to shift the harvest. Arriving at Troyes there was some evidence that there are other trains on this line with plenty of Corail coaches ready for the following week's trains. Departure from Troyes was followed by two lengthy sections of slow running due to track maintenance. This resulted in 20 minutes late running. Trying to clear the deficit 72147 accelerated away with a throaty roar soon reaching maximum line speed for the dash to Paris. On the section from Troyes you also pass one of SNCF's techni-centres which had a few TGVs scattered about the yards. Suburban electric trains flashed by at regular intervals as Gare de l'Est neared. Finally we screeched to a halt in what for me is one of the great Paris stations. Walking up the platform to the exit I passed 721xx which was already detached from the train and dead.